Is it a Benign Skin Lesion (Sun Spot, Liver Spot, Seborrheic Keratosis) or Skin Cancer? Hi everyone Today I want to discuss several benign skin lesions that appear on many people that can often look like skin cancers. These are the growths that bring many people into the dermatologist's office as they can mimic the appearance of all types of skin cancer. Fortunately, these benign lesions are much more common than the skin cancers! A very common growth is called a "seborrheic keratosis" and is related to age as they tend to appear after 30 years ofage. They tend to be rough and can range from being flesh colored to black. These skin growths tend to cause itching or irritation and can grow very quickly. Many people have multiple lesions and some people refer to these as "age spots" or "barnacles." If peeled off, they tend to grow back, and this frustrates many people! Fortunately, these are completely benign and have no cancerous potential. However, they mimic melanoma in that they can change size, color, and shape quickly and at times can be confused as being a "mole." Although these do not need any treatment, they are often removed surgically or frozen off (with liquid nitrogen) due to irritation or for cosmetic purposes. But remember, any growing lesion should be evaluated by a dermatologist even if you suspect it is just a seborrheic keratosis. Another common growth that closely resembles melanoma are"solar lentigoes," which are also called sun spots or liver spots. These flat, brown growths appear most commonly on the hands, arms, shoulders, and face as these areas receive sunlight on a daily basis. They are similar to freckles, but these do not disappear when you are out of the sun. Like seborrheic keratoses, a lentigo is benign despite the fact that it can resemble melanoma in shape, size, and color. Again, any new or changing mole or pigmented area of skin should be evaluated by your dermatologist. A lentigo does not need treatment but for cosmetic reasons, they are often treated with liquid nitrogen or a bleaching cream containing hydroquinone. 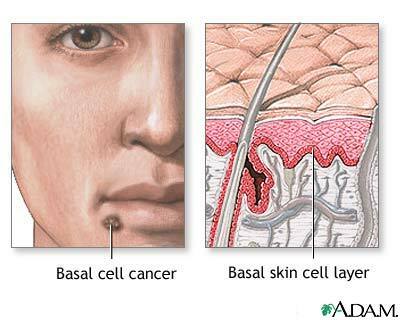 The face is a very common site for basal cell carcinoma and we often diagnose this cancer on the nose. A "fibrous papule" is a small benign growth that tends to appear on or around the nose. It tends to be a flesh-colored bump that can look like a pimple or closely resemble the "pearly" appearance of basal cell carcinoma. A fibrous papule grows to several millimeters in an area of the face that isoften exposed to the sun. At times, these can be easily diagnosed while at other times, a biopsy is necessary to differentiate it from basal cell carcinoma. A fibrous papule does not bleed or cause pain so any lesion that does bleed or gets a scab should be examined by a dermatologist. A fibrous papule does not need to be treated but they are often biopsied as they can closely resemble basal cell carcinoma. I hope that this blog has given you some information on some very common growths that worry people as they mimic skin cancer. While benign growths far outnumber cancerous growths, any new or changing lesion should be evaluated.